Also known as catadioptric lenses, these use curved mirrors instead of glass elements. 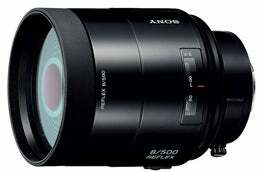 Because of this they can be made smaller and much lighter than standard lenses of the same focal length. Also, as light is not being dispersed as it ordinarily would through the elements of a lens there is no chromatic aberration (although other aberrations such as spherical aberration may still be caused). Due to their construction, mirror lenses do not offer an iris diaphragm for controlling aperture, and are also known to produce ring-doughnut shaped bokeh (out-of-focus areas), generally considered to be distracting.